"With all the fancy grilled summer meats flying around, it's easy to forget about the side dishes. Nobody wants to spend hours in the kitchen when they could be outside playing volleyball in jhorts. 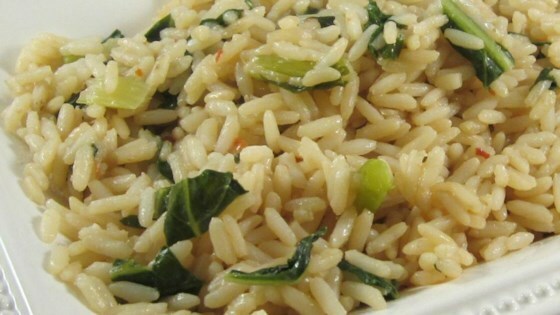 With this easy bok choy rice, you can have something much more interesting in the same time as it takes to make plain rice." Separate bok choy leaves from stems. Slice stems into 1-inch pieces; chop leaves. Combine water, rice, and soy sauce in a pot; bring to a simmer and stir in bok choy stems. Reduce heat to low, cover the pot with a lid, and cook until rice is almost cooked through, about 18 minutes. Stir bok choy leaves, chili-garlic sauce, and sesame oil into rice mixture with a fork. Remove pot from heat, cover the pot with a lid, and let sit until rice is cooked through and bok choy leaves wilt, about 5 minutes more. Fluff with a fork and garnish with sesame seeds. I added more soy and chili sauce like other reviews recommended. It was awesome and totally hit the spot when I was craving cold Chinese food the next morning too! this was our first time using Bok choy and we loved it. The only change we did was curry paste and garlic powder for the sambal...all we had. This was simple and tasted awesome! And my dream bride of 32 years complimented me on it. Had it with sous vide then seared chicken.